When the clocked struck midnight on New Years Eve, closing the door on 2015 and welcoming in the grand old year of 2016, I made a secret vow to myself: 2016 is going to be a year of happiness. The start of a new year always creates a time of reflection on the three hundred and sixty five days prior. Everyone wants to look back on the past year and feel a sense of achievement. In full retrospect of 2015, it wasn't the best of times for me. There were struggles within a number of areas of my life and, if I'm completely honest, they tend to be the things I focus on when I think back over the year. But I'm passionate about the idea that it truly is the little things that make life special. The seemingly tiny insignificant details and events of each day, the ones that put a smile on your face for whatever reason; they're of great importance too and each memory of such things should be valued. 2016 is going to be an ever so busy year for me with turning the grand ol' age of eighteen, sitting my A Levels and (fingers crossed) starting university. Despite having a hundred and one important things to be getting on with this year, a concept which stresses me out to the core let me assure you, I'm completely determined that my primary focus this year is myself and my own happiness. Besides, even during these hard times I'm certain that there's still going to be some rather great moments along the way; times full of happiness that just need to be remembered. To make sure that I remember the best moments of 2016, both big and small, I've decided to make the effort to record as many of them as I can over the course of the year. Then, when I'm having one of those tough days that we all face sometimes, I can simply open up the jar and have a little read of a few of my 'best bits' of the year so far. 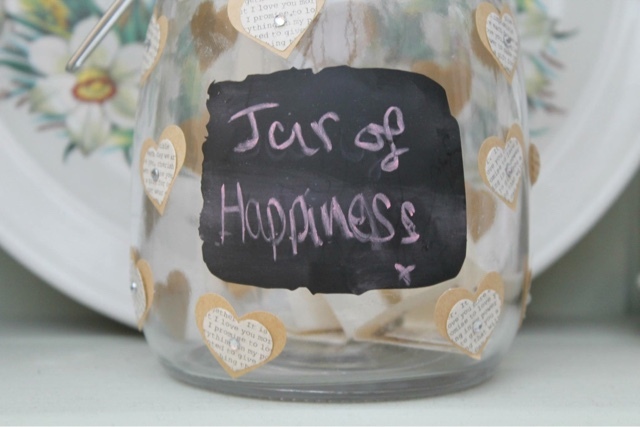 Reminding myself of the good times should work real wonders at lifting my spirits whilst making me feel ready to take on the world and create even more wonderful memories to add to the jar. This project is of course pinterest inspired (which ticks off part of one of my tasks on my 101 in 1001, might I add) but I've tried to be creative with the materials I've used and all that jazz. 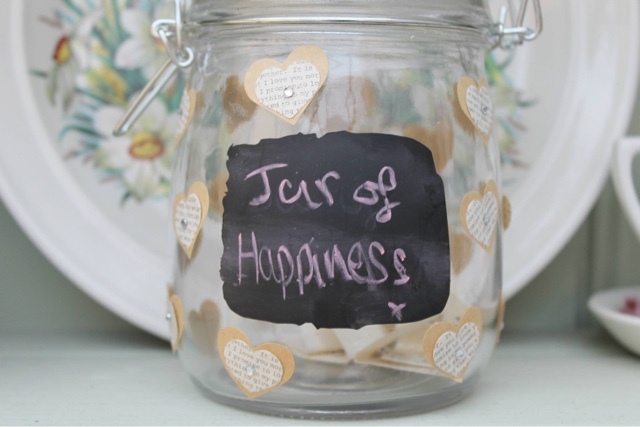 So many variations of the 'Jar of Happiness' exist within the blogging and pinterest worlds alike and I've been really loving reading lots of different takes on such a simple idea. Of course when a new DIY project was calling I popped off to the heaven of the crafting world that is Hobbycraft (which also offers a 10% student discount: win win). As someone who could easily navigate themselves around their local Hobbycraft with their eyes closed, it only took a couple of minutes for me to get my hands on the bits I needed to create the jar. I decided to use a Glass Storage Jar that features a chalk board front to provide an easy way for me to display the title of the project. In terms of decorating the jar I wanted to go for something simple yet pretty and, when craving a bit of a vintage shabby chic feel, I took myself over to the wedding aisle. To achieve a vintage-style I popped a handful of brown Heart Stickers around the jar and stuck a single piece of Newsprint Heart Confetti in the centre of each one. To complete the look I popped a simple Silver Embellishment in the middle of each decorative heart. 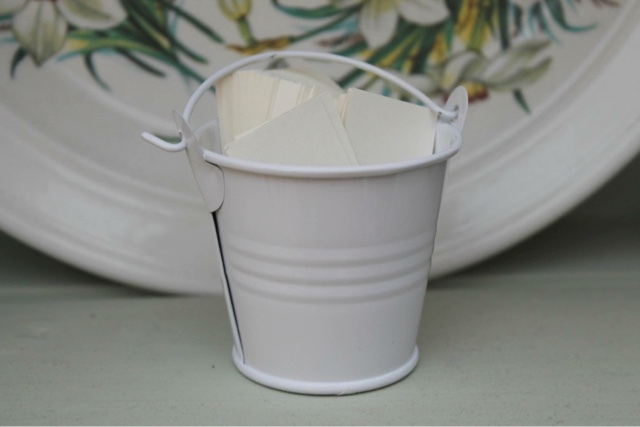 In terms of the cards I'm going to be using inside of the jar, I picked up a rather large bunch of Small Ivory Gift Tags and a small White Metal Bucket to store them all in. I've already noted down a handful of events and memories from the year so far and popped them inside of the jar and I'm really looking forward to seeing the contents of the jar grow and grow as the year goes by. Who knows what things are going to end up noted down and popped in the jar for safe keeping; only time will tell.